The Aquarium is stroller and wheelchair friendly, and designed especially with kids in mind, offering many interactive play opportunities. It’s a feast of color, exciting for young and old alike, a complete family-fun, immersive experience with as much hands-on as the imaginative Aquarium folks can devise. Who would have thought it, but it’s safe and harmless to pet a stingray as it glides by in shallow water – and this is exactly what you can do at the Aquarium. Don’t let your kids miss out on this marvelous experience. You can even arrange to go swimming with the rays, by reservation. The Aquarium features glass-walled pathways and tunnels that bring you literally face to face with countless strange and colorful denizens of the deep and not so deep. Kids will love to crawl through glass tunnels underwater, with pop-ups that emerge at the floor of a sea lagoon, eye to eye with fish swimming all around them. The Penguin Playhouse is the best example of this idea, with tunnels and pop-ups that get you up close with a colony of African penguins as they swim, and waddle on their shoreline habitat. 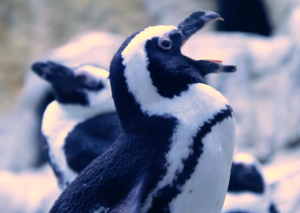 You can even arrange to pet a penguin, and pose for a photo – cameras and camcorders are encouraged in the Aquarium. The most stunning of all the areas in the Aquarium is the immensely beautiful Shark Lagoon. This is a large underwater glass tunnel with a moving walkway, a glide-path 340 feet long. It’s an immersive environment, with different types of sharks swimming all around and overhead. The glide path makes it simple to gaze all around without bumping into other people – an incredible experience you won’t ever forget. More petting for the kids is encouraged with the horseshoe crabs in the Discovery Center, an interactive play space with classroom facilities, fun facts and puzzles to solve. We tend to forget in all the excitement, but the Aquarium is actually a place to learn too. There are knowledgeable instructors answering questions everywhere you turn, and the staff are friendly and helpful. the Aquarium welcomes groups and even offers a home school rate. Many more special experiences can be arranged by reservation. The whole family can set up overnight camp with the penguins, or the kids can take part in an overnight sleepover with the sharks! You can also arrange to take a tour of the engineering system that is the heart of the aquarium – that 1.4 million gallons of water doesn’t just manage itself. If you drop in on a day trip, plan to spend several hours wandering around the Aquarium. You can stay as long as you like for the one ticket, and the food is really good, so it’s worth grabbing a bite to eat between the exhibits. Ripley’s Aquarium of the Smokies is centrally located in Gatlinburg, at Traffic Light #5 on Parkway. Every trolley in Gatlinburg’s fun and inexpensive trolley system goes to the aquarium, so you can park at one of the free places and trolley in. It’s worth visiting the Aquarium website before you go, to study the many options and facilities available. But studied-up or not, you cannot fail to have an exciting and fun time at Ripley’s Aquarium of the Smokies. This Free Coupon to Ripley’s Aquarium of the Smokies is just one of many Free Tickets that Cabins of the Smoky Mountains guests receive in our Trip Cash book of Free Coupons worth over $400.